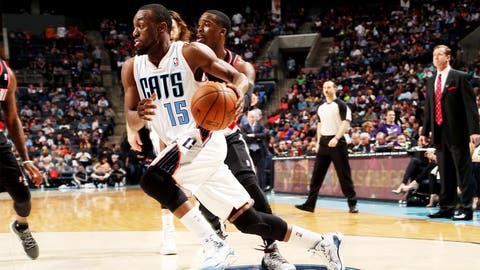 Kemba Walker (15) finished with 26 points and 6 assists, one of three different Bobcats to score at least 23 points. Al Jefferson scored 28 points and two others finished with more than 20 as the Charlotte Bobcats routed the Portland Trail Blazers 124-94 on Saturday night. Kemba Walker added 26 points, Gerald Henderson had 23 and Chris Douglas-Roberts 11 for the Bobcats, who finished with their highest-scoring game and most-lopsided victory in snapping a two-game losing streak. Damian Lillard scored 20 points, Dorell Wright added 17 and Wesley Matthews 15 for the Trail Blazers, who trailed by as many as 34 points late in the second half in their worst loss this season. Charlotte shot 52 percent from the field (49 of 94), outscored Portland in the paint 54-32 and held a 50-36 rebounding advantage over the Trail Blazers, who had won their last four games against the Bobcats. But Portland, playing without leading scorer LaMarcus Aldridge, could never get on track in losing for the first time in its last three games. The Trail Blazers shot 40.5 percent (34 of 84) and made just 9 of 27 3-pointers. That allowed Charlotte to bolt to an early double-digit lead, extend it to as many as 26 points late in the first half, then weather a half-hearted Portland comeback attempt early in the third quarter. Down 69-46 at the half, the Trail Blazers cut Charlotte’s lead to 17 points three times in the third quarter, the last at 77-60 on Matthews’ layup with 6:22 left. But Jefferson hit a jumper, followed by a 3-pointer by Walker to push the Bobcats’ lead back past the 20-point mark, and Portland never challenged again. Charlotte took its biggest lead of the game in the final two minutes behind its reserves, with Jannero Pargo’s 3-pointer with 1:22 remaining putting the Bobcats ahead 122-88. Behind Jefferson, Walker and Henderson, who combined for 48 points, Charlotte put together two of its best quarters this season in taking command of Saturday’s game. The Bobcats shot 58.7 percent from the field (27 of 46) in the first half, to 36.6 percent (15 of 41) by the Trail Blazers. Charlotte had 16 of its 28 assists in the first quarter, and had a 24-15 rebounding advantage in the first half. After missing its first two shots of the game, the Bobcats hit 11 straight – four by Jefferson, three by Michael Kidd-Gilchrist, and two each from Henderson and Walker – to pull ahead 23-9 with 5:03 remaining in the first quarter. The Trail Blazers cut the Bobcats’ lead to 10 points four times late in the quarter, the last at 31-21 on Mo Williams’ jumper with 54 seconds remaining, and were down 11 points at the end of the quarter. But Charlotte opened the second quarter with 11 unanswered points, with Josh McRoberts’ two free throws with 10:03 left putting the Bobcats up 42-22, their first 20-point lead of the half. Charlotte took its biggest lead of the half at 26 points late in the second quarter, with Jefferson’s layup with 1:43 left capping a 10-3 run for a 67-41 bulge. Notes: Trail Blazers coach Terry Stotts had no update on the return of Aldridge to the lineup. Aldridge, who leads the team in scoring (23.4 points) and rebounding (11.1 per game), has missed Portland’s last five games with a low back contusion. … F DJ White made his first appearance in a Bobcats uniform Saturday after signing a 10-day contract with the team a day earlier. The 6-foot-9 White played in Charlotte in 2011, and has averaged six points and 3.2 rebounds in 132 career games with Oklahoma City, the Bobcats and Boston.